Butea (Palash) is native to India and is found throughout the country. Palaash tree is also known as 'flame of the forest' because of its red colour flowers. It is a medicinal tree and its different parts are used to cure various clinical disorders. Palash is considered anti-inflammatory, antimicrobial, anthelmintic, antidiabetic, diuretic, analgesic, antitumor and astringent. Its leaves are astringent, diuretic and antiovulatory properties. Its flowers are tonic and nutritive. Its roots are used to treat night blindness. The tree is native to the Indian subcontinent and Southeast Asia. It is a slow growing tree that reaches a height of 40 to 50 feet. It has a crooked trunk and irregular branches. The leaves are 3-foliate and the flowers a bright orange red color. One can see the tree flowering in spring and in full bloom hardly any flowers are visible on the branches. From afar a cluster of trees gives the impression of fire in the forest and hence the name. The tree is a host for the Lac insect which produces natural lacquer. In India, this tree is associated with spring and various legends and myths are associated with this tree. The tree is held sacred in South India and its wood is used in Hindu fire rituals called yagna. The flowers of this tree do not open straight and even the unopened flowers are curved like a parrot's beak. Take Palash seeds and pound in lemon juice. Apply on affected area. The seeds of palash tree are anthelmintic and laxative. Its fresh seed juice is given with honey. 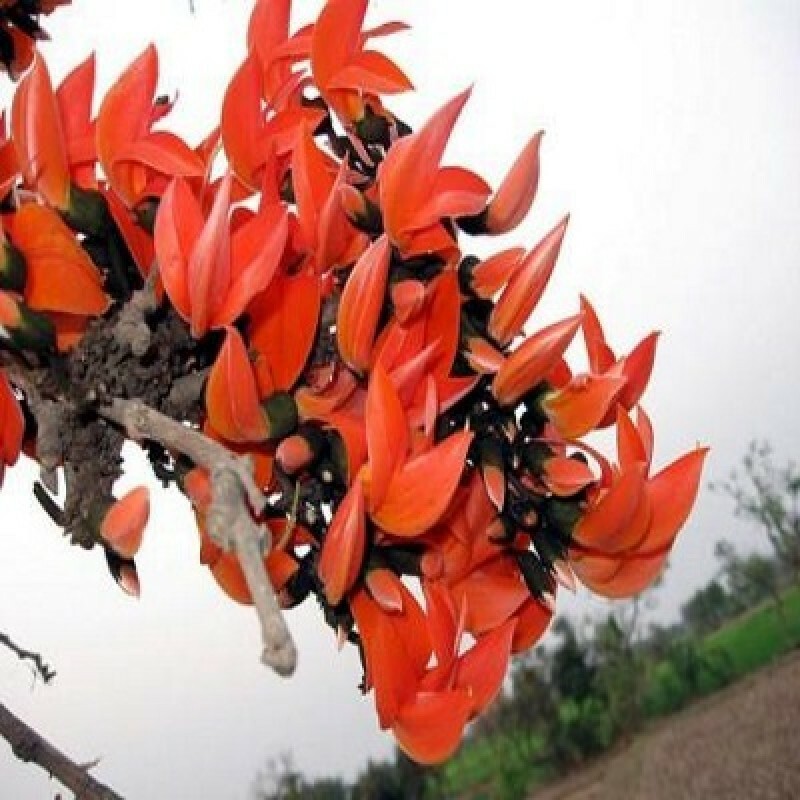 Palash or daak flowers are used to treat inflammation, swelling and sprain in body. Take Palash flower and cook in steam. For cooking in steam take vessel full of water, bring it to boil when steam starts coming put a mesh or grid on it as lid. Now put flowers on it. Apply these flowers on affected part. Palash flowers are used to remove body toxins. For this purpose dried or fresh flowers can be used. Take dried flowers and grind in mortar and pestle to make powder. Take 1 -2 gm daily. Take dried palash flower and make powder. This powder (1 teaspoon) should be taken twice a day with misri and milk. Take palash flower powder (2 gm) with misri (2 gm). If suffering from diabetes do not mix misri. The tree provides wood, resin, fodder, medicine, gum and dye. The wood is soft but durable even in eater and is used to make well curbs and water scoops. Charcoal of good quality is made from its wood. The wood pulp is used for newsprint manufacturing. The leaves are joined together to make a leaf plate to serve food and even bowls are prepared from the leaves. The flowers yield a color that is used to dye fabric and is also used a a color in the Holi, the traditional Indian festival of colors. The tree provides a gum that contains tannins that are used in the leather industry as well as in drugs. The gum is also used in some food preparations. The flowers act as a bait to attract mosquitoes to lay their eggs. They die when they enter the flower as they are not able to come out as they get caught in the fluid contained in the flower. The eggs that these mosquitoes lay in the fluid do not hatch as well. The bark fibers are used to make cordage.